It is with profound sadness that Canterbury University Press has received the news of the death of author Gordon Ogilvie who passed away on Monday 23 October. 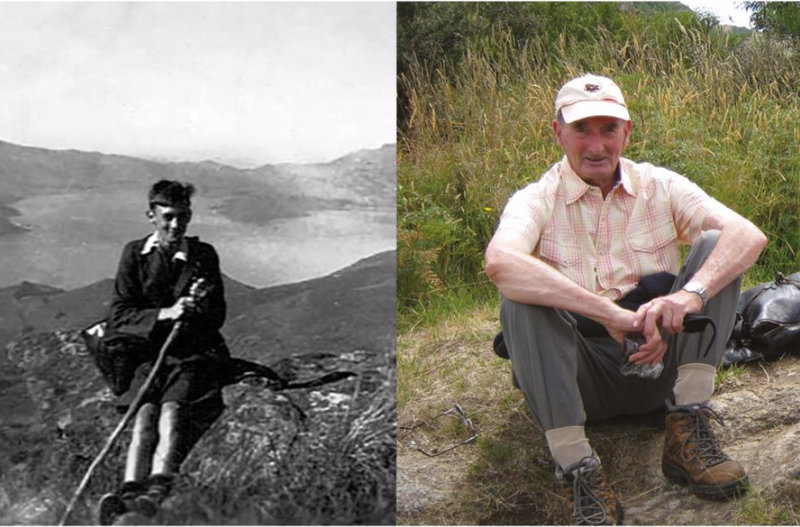 (Pictured above left) Gordon Ogilvie aged 11, exploring the Port Hills skyline above Horotane Valley; and (above right) some years later resting below Sugarloaf, Port Hills. Gordon Ogilvie achieved great acclaim as an author of award-winning regional histories. In 1998 he received an Arts Excellence Award from the Canterbury Community Trust and was included by the Society of Authors in the Christchurch ‘Writers’ Trail’. Two year later he was awarded an honorary doctorate by the University of Canterbury, and in 2007 received an ONZM for service to historical research and writing. Spring Gradfest starts next week with a variety of sessions to help you along the thesis journey, as well as new social events where you can meet other postgraduates from UC. Although your main focus at UC will be on your postgraduate work, something valuable I learned at a previous Gradfest is that it is still important to make time to socialise. Thesis study can be an isolating experience, and it’s important to make friends to survive and thrive. Knowing that social time is acceptable keeps you from feeling guilty about it, and you’ll find that learning to manage your schedule is a vital part of the journey. Gradfest has a variety of sessions to help you with your thesis work, including ones on writing, presentations, and technology. But this time it also has new social events like a Welcome social in the Shilling Club and a BBQ lunch. These are great opportunities to meet fellow postgraduates from other departments, so be sure to make space in your schedule for them. Group work is better – yeah/nah? This culture conversation looks at empowerment through self directed teams. It is made up of two x 1 hour sessions. Session 2 of 2 sets out to apply this approach in our teams – with a special focus on visual graphic systems for communication. Does face to face engagement beat technology? The next Session 2 of 2 is at Dovedale DD02-101 at 2pm Thursday 2 November. Email alan.palmer@canterbury.ac.nz to book your place. Booking not essential but helpful in planning materials/handouts etc. Also indicate if you wish to be on the outlook invitation for all sessions. That’s the best way to find out about what’s coming up. Visual Management Boards provide a focal point for self directed teams to share their purpose, their direction, their ideas, their to-do list and their results. Team members gain skills along the way. See different examples of visual management boards at the workshop. Don’t be shy! If you would like to share examples of your visual management display boards please email photos to Alan by 5pm Wednesday 1 November. This workshop is part of a series of culture conversations alternating between Ilam and Dovedale Campuses. Join us in an informal workshop environment and share your knowledge and experiences from your team with a wider group. The workshop will be facilitated by Alan Palmer. The purpose of these workshops is to encourage teams across Learning Resources to meet and learn from each other about shaping a constructive work place culture that values people. For the dates of further sessions refer to this timetable link. Please forward this blog to anyone you think may be interested. The Reporting Sexual Assault To Police series takes you through the process of reporting a sexual assault for adults 18 years and over. In STEP 5 Detective Nicole Bourke outlines what happens at the formal interview. We all know how good exercise is for our body and mind, but it can be a real challenge to maintain interest and prioritise it, especially as we get busy. It can be daunting, it can be exciting, it can be many things to many people. Whatever you’re feeling about exercise, doing it with a friend, colleague or family member might be the solution to increase your motivation, and here’s why…. It’s hard to get bored if you have an exercise buddy, and it will help the time pass quickly too. Perhaps you have a team member or work colleague who is showing a vague interest in starting an exercise routine? Commit to a plan together and you’ll have something to talk about as you get to know them during your workout sessions. It’s not a nice feeling being stood up, nor letting someone down by not turning up. So, having an exercise buddy means you’re less likely to bail on the workout with lame excuses. Variety is one of the keys to sticking to a plan, things get boring after a time. Your exercise buddy might have some interesting ideas to try out that you don’t know about. It’s fun learning something new and maybe less reason to quit. There are of course plenty more reasons, these are just our top four! For a simple start, try scheduling a walk during your tea breaks or lunch break (or all three!) with a colleague. Make these non-negotiable to ensure you get some healthy movement into your day. Even a 5-10min jaunt will see you refreshed when you’re back at your desk! If you’re keen on starting at the gym, we’ve got an awesome summer special starting 1 November, available for purchase throughout November. Check out our specials page for more info. Memberships are available to everyone, not just UC staff and students, so you can bring your exercise buddy with you! Not sure if we’re the right gym for you? Fair enough! Why not request a 7 day guest pass and try it out? Passes are available to anyone (yes, non-UC staff too!) who hasn’t been a member with us within the past 12 months. Enjoy these blissful summer days coming our way!